George Perkins early years were spent working on the family farm, which he did not enjoy. His dream was to become a captain of a ship. At age 13, he applied for a position as a cabin-boy, but he was considered too young. Not to be deterred, George hid on the ship and was not discovered until the ship set sail. He was set to work as one of the cabin-boys. He arrived in San Francisco when he was 16. Perkins tried his luck at mining for several months, but was unsuccessful. He moved to a mining camp in Ophir where he drove a mule train and worked as a porter in a store. Perkins eventually became a clerk at the store and earned a salary of $60 a month. When business had slowed, Perkins bought the store. By the age of 20, Perkins grossed about $500, 000 annually through his trade in merchandise, produce and provisions. 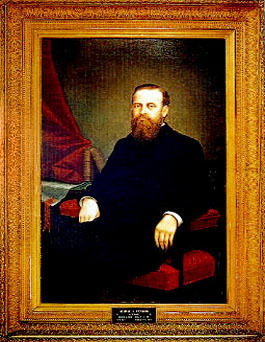 Perkins was elected to serve as a term as a state Senator in 1869 and was re-elected in 1871. This was the turning point in Perkins’ political career as well as in his business career. While Perkins was in the Senate he met Captain Manor Goodall. In 1872, Perkins and Goodall formed the Goodall, Nelson and Perkins Steamship Company, which was renamed the Pacific Coast Steam Navigation Company. It was a very successful company. In 1873, Perkins was elected to fill the unexpired term of Senator Boucher, who passed away in late 1872. In 1893, Governor Markham appointed Perkins to fill out the unexpired term of U.S. Senator Leland Stanford, who had passed away. Perkins was re-elected to the U.S. Senate three more times. He retired from the Senate in 1915 and returned to Oakland. Use the California State Library’s interactive tool to view Executive Orders and Proclamations signed by Governor Perkins.